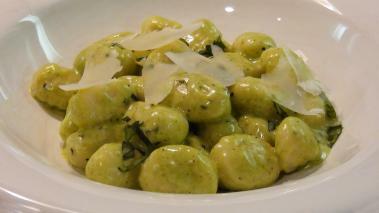 Gnocchi in pesto cream sauce is an Italian/American classic. And in this recipe video I show you how to make it. I haven’t made my own gnocchi, which would be the toughest part of this recipe, because there are a lot of good store bought options out there...and because I rarely have the time to make them. The rest of the dish takes little more than 30 – 40 minutes to make, but it looks like it takes a lot longer – which is course great if you want to impress a special someone! Don’t overcook the Gnocchi. They get very soft and mushy when overdone. Generally, once they float in the boiling water, they are done, but check your package. You can shave your parmesan over the top as I did ...which makes a great presentation. I love this dish with some good crusty garlic bread, and a nice bottle of wine. Hope you give it a try soon, and that you love it as much as I do. Leave a comment to let me know how it goes. Blanching the basil made a big difference in the taste of the pesto. Mine had plenty of garlic and I even made my own gnocchi! It is indeed an easy, very tasty dish. Sauteed zucchini made a good side dish. The wine was montepulciano. This dish can handle a non-whimpy red wine.